Description: Four Swiss Mountain Passes in Switzerland. 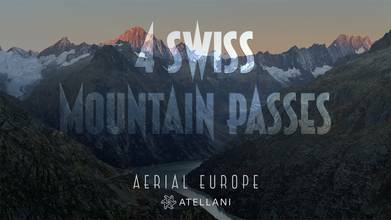 Cinematic drone video in 5K UHD of the Gotthard, Grimsel, Furka and Susten Passes. The Grimsel Pass links the Hasli Valley in the Bernese Oberland with Goms in Valais. The pass road runs through a wild, sparsely grown mountainous region marked by granite rocks, reservoir lakes, and power plants. Innertkirchen near the holiday resort of Meiringen is the starting point of two impressive pass roads. The Susten Pass leads eastward to Central Switzerland. Southward, a splendidly constructed road climbs in large bends in the direction of the Grimsel Pass. In the Guttannen, the “Crystal Village”, one can admire crystals of all sizes in the Prospector’s Museum. The road ascends through canyons of wild beauty that get narrower and narrower. Hydroelectric power plants, high voltage power lines and high reservoir lake walls dominate the landscape on the northern side of the Grimsel Pass. The Furka Pass (Furkapass), also made famous by a scene from James Bond 007 "Goldfinger' is a gorgeous Swiss mountain pass. The pass also features the Rhone Glacier, once a famous attraction, but now disappearing year by year, probably because of global warming. The video also features the once famous Hotel Belvedere, once a major hotspot and celebrity destination and now closed because of the Rhone glacier's retreat and loss of appeal. View cinematic footage of the Historisches Alpinhotel Grimsel Hospiz and the dams around it, such as the Grimsel Dam. he first certified guesthouse of Switzerland was located at this exact place, way back in 1142. In 1932, the Grimsel Hospiz caused quite a sensation as it was the first electrically heated house in Europe. Environmental considerations had to be taken into account when the hotel was completely renovated between 2008 and 2010 and the entire hotel is now heated by using hydroelectric waste-heat. As a historic 4-star alpine hotel in the heart of the KWO catchment area, the Hotel Hospiz reigns majestically above the Grimsel reservoir lake (Grimselsee). The Gotthard Pass or St. Gotthard Pass (Italian: Passo del San Gottardo, German: Gotthardpass) at 2,106 m (6,909 ft) is a mountain pass in the Alps traversing the Saint-Gotthard Massif and connecting northern and southern Switzerland. The pass lies between Airolo in the Italian-speaking canton of Ticino, and Andermatt in the German-speaking canton of Uri, and connects further Bellinzona to Lucerne, Basel, and Zurich. The Gotthard Pass lies at the hearth of the Gotthard, an important north-south axis in Europe, and is it crossed by three major traffic tunnels, each being the world's longest at the time of their construction: the Gotthard Rail Tunnel (1882), the Gotthard Road Tunnel (1980) and the Gotthard Base Tunnel (2016). With the Lötschberg to the west, the Gotthard is one of the two main north-south routes through the Swiss Alps. Since the Middle Ages, transit across the Gotthard played an important role in Swiss history, the region north of Gotthard becoming the nucleus of the Swiss Confederacy in the early 14th century. The Susten Pass, in the URI Canton of Switzerland. Views of the lake and glacier. The pass is a pristine, absolutely stunning location. The Susten Pass is one of the best 10 passes in Europe, featuring some of the nicest mountains in the alps.